At this point in time, it is fair and safe to count Darkest Hour amongst the few acts to have survived the Metalcore era from which their mainstream success took root. As the band enters its 22nd year with this ninth full length-record, one can already measure in the factors that have set them apart from their lesser peers, not the least of which is their audacity to expand and experiment on their heavy melodic death metal formula. The last few efforts by Darkest Hour saw a progressive shift in the bands’ sound, from the often overlooked The Human Romance leading up to their Self Titled album, which saw the band edging towards Alternative Metal territory with angsty, clean sung metal core hooks and a sharp, digital production (courtesy of Sumerian Records). While competent and admirable in its delivery, fans and critics alike were beginning to grow concerned about the bands’ sound falling into a generic register. With Godless Prophets and Migrant Flora, the Washington-based quintet seem to have picked up these concerns. As the record jumpstarts into the thrashy opener that is “Knife in the Safe Room”, we quickly come to understand that the band aimed for a different approach for this record. Godless Prophets and Migrant Flora is a heavy record, and a pretty intense one at that, the bursts of rapid-fire drumming and string-skipping-based riffs of the opener serving as a decent representation of a good deal of the record. The band returns to their old-school roots on this record, setting their modern metalcore leanings aside, in favor of a rawer, Swedish Melodic Death Metal sound.The most notable difference on this record may very well be John Henry’s vocals, undoubtedly the most distinguishable feature of Darkest Hour’s sound. Ditching the clean vocals, Henry’s ferocious saturated vocals reach a new level of intensity, adding to the album’s overall merciless sound. Another highlight feature for this ninth record is the lead guitar work, which also makes a triumphant return on this record, with flamboyant solo licks that seem to stem straight from a Megadeth or Metallica record. Wilder and flashier than on the previous record, the guitarists go full-on Kirk Hammett on the Wah pedal, providing for exceptional solos on tracks like “Another Headless Ruler of the Used” and “The Last of the Monuments”. Beyond the brilliant return to roots, the album does however score lower than its predecessors in terms of pacing and diversity. The album pummels you with track after track of feral thrashing for a solid half of its runtime, leaving little in the areas of breathing space and dynamic range. This comes as a particularly regretful realisation as the last few records which the band seems to shy away from were particularly well paced and diverse. The album does end up providing some variation towards its second half with an instrumental interlude and epic, slower tracks like “In the Name of Us All” and “Enter Oblivion being stuck at the end of the album. Overall, despite its flaws, Godless Prophets and Migrant Flora is a incredibly effective album, one that will undoubtedly reclaim Hidden Hands of a Sadist Nation-era fans. While this ninth record may alienate newfound fans of the band, it does admittedly feel great to hear the band return to their roots at the height of their form. 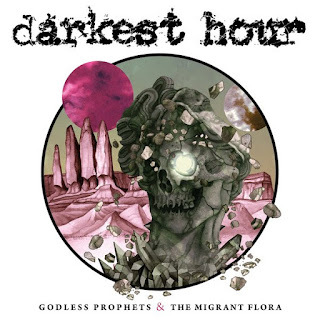 While some may call Godless Prophets and Migrant Flora a “return to form” for Darkest Hour, one must be weary of such accolades, as it undermines the brilliant consistency of the bands’ musical output.